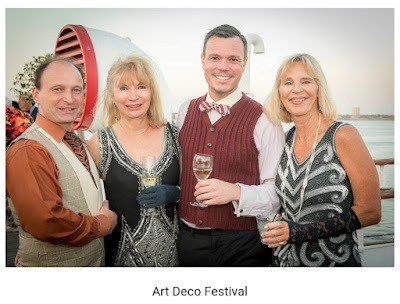 Art, Décor, Inspiration... All things Queen Mary at the Art Deco Festival! Summer is NOT over yet! Give yourself one last local outing and enjoy some artistic entertainment too. Pack your vintage duds and dust off your dapper suits for the Queen Mary’s 13th annual Art Deco Festival returning to the majestic ship August 19 – 20, 2017. Produced in collaboration with the Los Angeles Art Deco Society, the Queen Mary invites attendees to come aboard and drink, dine, dance, and discover the opulence of this by-gone era immersed among the largest Art Deco collection in the World. The 2-day festival celebrates the artistic movement that influenced the design of The Queen Mary, the world's most advanced ocean liner of its time. Daily festival activities include shopping for favorite vintage items, marveling at authentic collectables and having your hair styled from your favorite era in the Vintage Bazaar. Experience one-of-a-kind lectures by experts on the period throughout the day on both Saturday and Sunday. The Grand Ball ($199 add on), the Art Deco Festival's flagship and fan-favorite celebration will take place on Saturday, August 19 at 7 p.m. The formal vintage 'dress-to impress' evening presents a lavish four-course historic menu with the Dean Mora Orchestra complementing the mood. Then on Sunday sip on vintage inspired libations and experience traditional tea service while taking a turn or two around the dance floor at the Swingin’ Sunday Tea Dance ($49 add on). The Queen Mary’s Art Deco Festival is a one-of-a-kind, spectacular stroll through time on August 19 – 20. Day passes start at $25 per person and include access to the Queen Mary, her restaurants, the Observation Bar, Art Deco Lectures and access to the Vintage Bazaar. The Art Deco Grand Pass is $229 and includes two-day access to the festival and admission to the Grand Ball, Sunday Tea Dance, all Lectures, and Vintage Bazaar access.